Please note that there is only a limited amount of parking sites available at Urstein Campus. When arriving by car, please only park in the appropriate sections. Via motorway A10 (“Tauernautobahn”) (both directions): Driving on the motorway A10, take exit “Puch Urstein Fachhochschule”. At the roundabout, turn right. After about 500 metres, the campus is located on the right hand side. Coming from Salzburg, follow “Halleiner Landstrasse” heading south (towards Oberalm-Hallein). At the second roundabout after the village “Elsbethen”, turn right (at the grocery store “Spar”). After 200 metres, the campus is located on the left hand side. Coming from Hallein, follow the “Halleiner Landstraße” heading north (towards Salzburg). At the first roundabout after the village Puch (next to the grocery store “Spar”), turn left. After 200 metres, the campus is located on the left hand side. From Salzburg Central Station/Südtiroler Platz, buses of the regional bus line 160 heading towards Hallein run every 60 minutes (at peak times every 30 mintues). 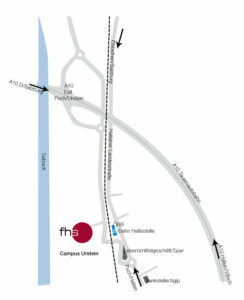 Get off at bus stop “Puch Urstein (FH)”, which is located right off-campus. Travel time is approx. 25 to 30 minutes.